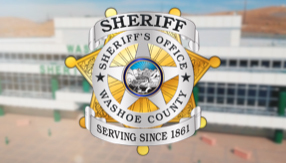 Washoe County Sheriff's Office detectives are investigating an apparent inmate suicide that occurred earlier today in the Washoe County Detention Facility. At approximately 11:30 a.m. on Friday, April 12, 2019, detention facility deputies and medical staff responded to a medical emergency involving a male inmate in one of the housing units. Staff immediately began life-saving measures. REMSA and the Reno Fire Department were also notified and responded. The inmate was declared deceased by medical staff at 11:46 a.m.